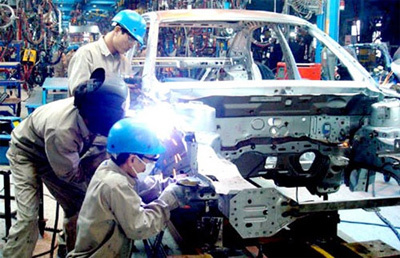 Vietnam’s industrial sector is seeing positive changes in structure, despite a fall in the index of industrial production (IIP) this year, the Ministry of Industry and Trade reported. IIP increased 7.4% year-on-year in the first nine months of this year, compared with 9.8% in the same period last year. The decline of the index was mainly because of the mining industry, which slumped by 4.1% year-on-year in production value in the first nine months of 2016. However, the manufacturing and processing area posted year-on-year growth of 10.4% in these nine months, showing signs that the domestic industrial sector is becoming less dependent on the exploitation of natural resources, especially minerals. The ministry said mineral and fuel export value reached some US$2.5 billion in the first nine months of this year, a decline of more than US$1.4 billion, or 35.5%, over the same period last year. Crude oil exports fell by 25% in volume and 43.3% in value. Export prices dropped by 24.3% for crude oil, 64.5% for some metal ores and 29.4% for petroleum products. The Vietnam Oil and Gas Group (PetroVietnam) said declining oil prices could significantly affect its business this year. In the first nine months, oil prices averaged US$42.7 per barrel, equivalent to only 71.2% of the estimated US$60 per barrel. Oil prices were also down 25% over the same period last year. The company earned VND327.4 trillion (US$14.55 billion) in nine-month revenue, representing 86% of its target for the period and 61% of its annual quota. The coal sector also reported high inventories this year, mainly due to some thermoelectric plants such as Vung Ang and Uong Bi ceasing production a few months earlier. Some cement factories used more imported coal for production, since it was cheaper than domestic coal, which resulted in increasing exploitation costs. On the other hand, the electricity sector posted a year-on-year rise of 11.6% in production output in the first nine months of this year. The ministry said this was satisfactory and met local demand. Iron and steel production also expanded by between 11% and 24% in the first nine months of 2016, compared with growth recorded in the same period of 2015. Dao Phan Long, vice chairman of the Vietnam Association of Mechanical Industry, said iron and steel production was among the many manufacturing and processing areas that were wintessing faster development. The processing area alone generated export revenue of some US$102.66 billion this year, up 8.5% year-on-year. Revenue accounted for more than 80% of the country’s total export value, official data revealed. 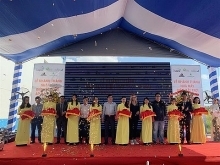 By producing products with higher values, Vietnam was heading towards more sustained growth, Long said. To maintain this trend, the government needed to have proper policies related to land use, taxation, capital and technology to encourage manufacturing and processing enterprises, he said. The industry and trade ministry said it would reserve financial resources for development of the country’s key export products, such as seafood, footwear, garments and textiles, to ensure a boost in overall export growth in the coming months. The ministry added it would concentrate on promoting trade in the United States and the European Union and stimulating the integration of domestic enterprises into global and regional value chains. Industry insiders said Vietnam should avoid relying on a few major enterprises to boost exports in view of the recent incident with South Korean electronics firm Samsung. Samsung, which has factories located in Vietnam, has recalled its Galaxy Note 7 smartphones over the risk of their batteries overheating and catching fire, and this was forecast to have an impact on the country’s export indices./.